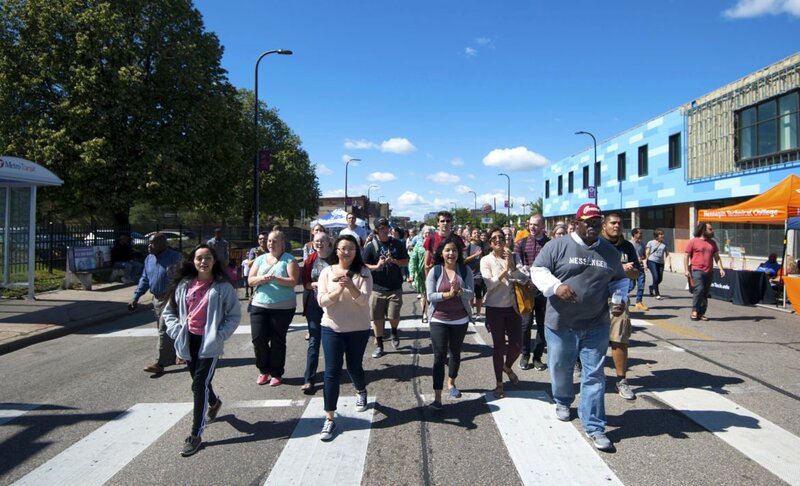 North Minneapolis residents celebrate Open Streets West Broadway in 2016. Simple language choices can be crucial to inclusivity. Photo courtesy of Flickr user Fibonacci Blue. The thing is – and I’m only about the millionth person to say this – people’s needs and desires aren’t all uniform. Needs being met for one person or community doesn’t necessarily map to needs being met for another person or community. A popular way to illustrate this is to think about providing shoes to a group of shoeless children. If every child gets the same exact pair of shoes – size, style, etc – they’re getting literally “equal” resources, but only a fraction of those children are actually getting their needs met. So, after first asking why the children are shoeless in the first place, I avoid using “regardless of” phrasing to talk about equitable access and outcomes. A simple swap that transforms the phrase is to say, “with respect to.” For example, “all people should have access to healthy, tasty, nourishing food, with respect to their culture, religion, dietary needs,” etc. All of a sudden, with not too many additional characters, you’ve transformed a phrase from not taking anyone’s uniqueness into account, to deliberately taking into account those important characteristics that impact people’s needs and desires. And the thing is, it doesn’t specifically have to be the phrase “with respect to,” it could be any kind of phrasing that still actually honors people’s differences and helps make whatever report, grant application, workplace policy, piece of legislation, or other document you’re working on strive for something that is ultimately more useful for individuals and communities. The Yarn Mission, a knitting collective founded by Black women for the achievement of Black liberation, posted a related article by CheyOnna Sewell from the Minneapolis chapter. In the article, Sewell highlights “regardless of” in another important way that I don’t talk about above. Sewell said, “regardless of” also carries the implication that it is these characteristics of identity that are the problem, not the systems of oppression that abuse & marginalize some folks with one identity and privilege and advantage some folks with other identities. She goes beyond “with respect to” and asks, how do you talk about an event (in the case of the post) such that it’s clear that racism, sexism, transphobia, ableism, classism, are not welcome? Check out the Sewell’s analysis on the impacts, particularly on the emotional labor of marginalized people, of describing events in this way.